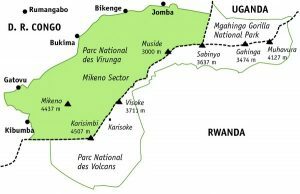 The Virunga National Park originally known as Albert National Park lies in the north-east of the Democratic Republic of the Congo, on the frontier with Uganda’s Rwenzori Mountains in the North and Rwanda’s Volcanoes National Park in the East. The park is part of Lake Edward, the Semliki River valley, parts of the Rwindi, Ishasha and Rutshuru valleys south of the lake, the Virunga area within the Democratic Republic of the Congo, and part of the Rwenzori range. 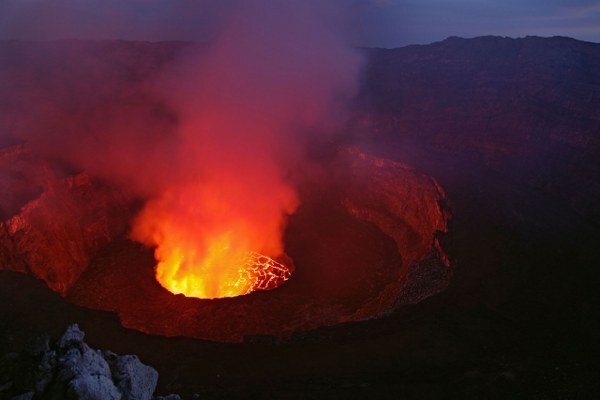 Nyiragongo Volcano; Nyiragongo is a wonderful strata-volcano that has the world’s enormous or huge lava lake. The volcano’s forested lower slopes are habitat to various wildlife species including the rare chimpanzees, monkeys, and bushbuck. Nyiragongo’s summit rim is largely devoid of vegetation and is frequently dusted with snow. From the rim, toursits can peer down into a churning lava lake and see and hear hot gases exploding up though a mosaic of molten lava. Although predictable and therefore safe for tourists, Nyiragongo is greatly feared during eruptions. Because of the low silica content of its lava, Nyiragongo’s lava flows are extremely fluid. During the 2002 eruption, some of Nyiragongo’s lava flows were clocked at 100 km/hr (62 mph) and reached all the way to Lake Kivu. Treks to the peak/summit of Nyiragongo volcano begins at the Kibati patrol post, which is approximately 30 minutes by car from the nearest Goma town. The patrol post is less than a one hour drive from the Mikeno Lodge in Rumangabo. Park rangers lead all treks and porters (unaffiliated with the park) are available for hire. The time required to reach the summit depends on the average fitness of each group, but typically takes 4 – 6 hours. Altitude sickness can be an issue for some visitors because the climb starts at 1989m (6,525 ft) and ascends to 3470m (11,382ft) in a short time. Proper hydration is the best way to adapt to the change in altitude. People prone to Acute Mountain Sickness (AMS) should speak to their physicians about taking preventative measures before making the climb. It is possible for fitter people to climb up and descend in one day, but most groups choose to overnight in basic accommodation available at the top/summit. Glacier of the Rwenzori Mountains in Virunga National Park; Situated in the north of Virunga national park on the border with Uganda, Rwenzori Mountains is a snow capped mountain range. The highest peak /summit in the range lies on the frontier and can be hiked from both Ugandan and Congo’s side. The trek to the glacier can be made in a 4-5 or 6 day trek. In order to start the trek visitors will need to travel to Beni by airplane (either from Goma or Entebbe). Lake Edward (Rutanzige); The lake also lies with the range of Virunga national park. The lake’s shallow has an impoverished fish fauna, with many cichlid species, and quite a rich invertebrate fauna. Recently crocodiles have returned to the upper Semliki River. The monitor lizard and snakes are common including python, puff adder, cobra and green mamba among others.All these can be encounter when on safaris to Virunga national park in DR Congo. Mountain Gorillas Trekking; Mountain Gorillas in the famous Virunga National Park are located in the Mikeno Sector, about a two and half hours’ drive from Goma. 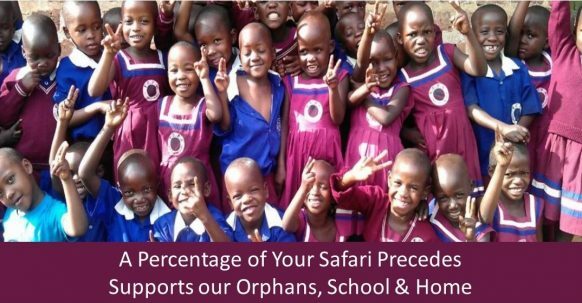 They can also be approached from Bunagana (border of Uganda). The permit is $400, so slightly cheaper than in Uganda or Rwanda. The visits are also a bit more authentic and in smaller groups. Gorilla trekking permit is booked via the Congolse Wildlife Authority sales office in Goma or alternatively, you can also book directly with ICCN. A visit to habituated mountain gorilla family in Virunga is a life changing experience. 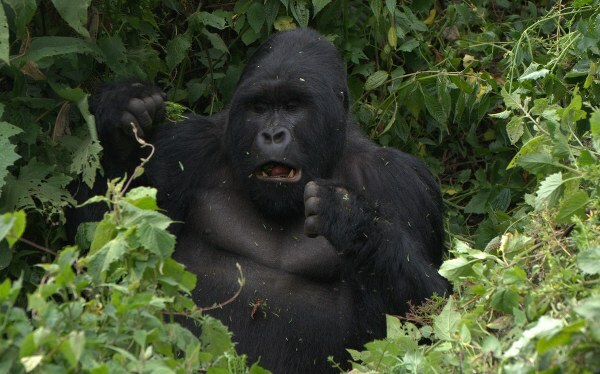 Mountain gorillas are highly intelligent, good natured, and luring to observe. The silverback’s powerful presence is awe-inspiring, yet his calm clearly earns him the title, “gentle giant”. Visitors are equally struck by the tenderness and care that mothers show their young. And then, of course, there are the juveniles who spend most of every waking hour at play and never cease to make visitors smile. We believe your time with Virunga’s mountain gorillas will leave you feeling changed for the better. To protect the health of Virunga’s gorillas, tourists are required to wear surgical masks that are provided to trekkers when they confronting the mountain gorillas in their natural habitat of Virunga National Park. Time with the gorillas is strictly limited to one hour. If you don’t feel well, have a fever, diarrhea, or persistent sore throat – please do not go on the trek. 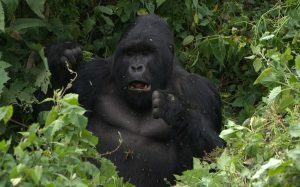 Mountain gorillas are extremely susceptible to human illnesses. 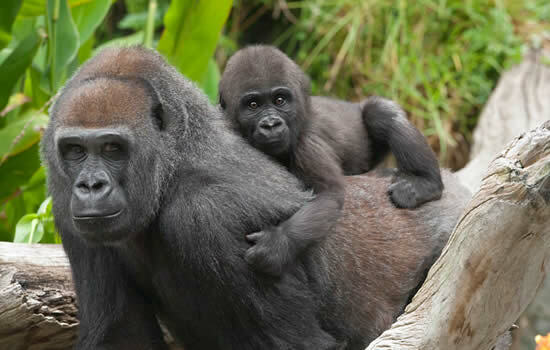 Gorillas have died after being exposed to human respiratory viruses and other common ailments. Nyiragongo Volcano Hike; This volcano, famous for its lava lake is worth exploring. A hike to the summit or peak of the volcano is a technically easy especially from the direction of Goma. A Hike to the top /peak of the Volcano usually takes 6 hours; most climbers spend the night at the top. This also makes it possible to see and enjoy the boiling lava by night, when it becomes even brighter. Treks to the summit of Nyiragongo volcano begin at the Kibati patrol post, which is approximately 30 minutes by car from Goma. The patrol post is less than a one hour drive from the Mikeno Lodge in Rumangabo. Park rangers lead all Hikers and porters (unaffiliated with the park) are available for hire. The time required to reach the summit depends on the average fitness of each group, but typically takes 4 – 6 hours. Altitude sickness can be an issue for some because the climb begins at 1989m (6,525 ft) and ascends to 3470m (11,382ft) in a short time. Proper hydration is the best way to adapt to the change in altitude. People prone to Acute Mountain Sickness (AMS) should speak to their physicians about taking preventative measures before making the climb. It is possible for fitter people to climb up and descend in one day, but most groups choose to overnight in basic accommodation available at the top (included in the permit fee). Trekkers are advised to bring raincoats and cold weather gear. Rain showers are a common occurrence on the climb up during the rainy season and temperatures at the summit can dip below 0°C/32°F. Rwenzori Mountain Trek; The Rwenzori Mountains are a snow capped mountain range located in the north of Virunga National Park on the frontier with Uganda. 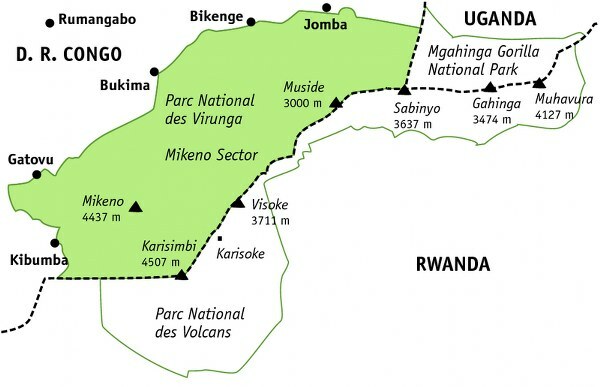 The highest peak in the range lies on the border and can be climbed from both countries (Congo and Uganda). The trek to the glacier can be made in a 4-5 or 6 day trek. In order to start the trek visitors will need to travel to Beni by airplane (either from Goma or Entebbe). Overland journey via Uganda, cross the border in Bunagana, from where the Mountain gorilla sites Jomba and Bikenge can be reached within 1 hour. The border crossing is easy, and a local visa can be bought at the border for only 50$, however this visa is not a fully recognized visa and can only be used to visit the park and subsequently leaving the country at the Bunagana border post again. Mikeno Lodge is a hidden gem within Virunga National Park. The lodge is 90kms about 1-2 hours’ drive from the famous Goma town. The bungalow accommodation is spacious, luxurious & very private, each with fabulous tree or valley views. Each bungalow has its own fireplace, which the staff light every evening while visitors are out enjoying the scrumptious dinner. The lodge‘s restaurants are located within a forest and offers beautiful views of the rift valley and Nyiragongo and Mikeno volcanoes. Mikron Lodge offers access to local community walks and a number of wildlife activities like tracking the endangered mountain gorillas or the chimpanzees, Blue monkeys, baboons, and colobus monkeys. Accommodation places in Goma town. Lac Kivu Lodge situated on plot 162 Avenue Alindi – Quartier Himbi, Goma, North Kivu, is a beautiful lodge extensively established in lush tropical grounds on the shore of Lake Kivu .While in Goma or Visiting Virunga national park,, this lodge with its family atmosphere will delight you. The lodge has beautiful rooms that are distributed as Economic, Budget Room, Standard Room, Standard Plus, Classic Room, and Deluxe Room. From Budget to Deluxe category, espresso coffee machine, locally made rocking chair on each balcony are offered in each room. Lac Kivu Lodge has recently extended and now 13 more rooms which are available with access through the actual Lac Kivu Lodge 1. There, the typical architecture of three houses turned into bedrooms are very fascinating to each and every visitor staying in the rooms. The restaurant in the lodge is reputated for being the best table in Goma and it serves both local and international dishes. In regard to events and conference, the lodge has two conference rooms are which are at visitor’s disposition, for seminaries or meetings. Ihusi hotel is popular top-end hotel in the Centre of Goma overlooking Lake Kivu in the Democratic Republic of Congo, in North Kivu province. It is situated some 500 meters inside the border with Rwanda, capital tourism. Ihusi hotel offers a splendid panorama of Lake Kivu and Virunga mountains. The hotel has a charming beautifully architecture built in Greco-Roman style. Hotel Linda is 3 star hotel, located in the eastern Democratic Republic of Congo; It is constructed in modern architecture, meeting international standards .It’s just 4kms from Goma International Airport just. It’s a perfect place to base while visiting Nyiragongon volcanic sites visoke or when trekking the mountain gorillas Jomba Bukima Mountains in Virunga National Park. The hotel accommodation rooms offer a direct view of Lake Kivu and they are equipped with fridges, TV’s (DSTV, CANAL SAT,), Intercom, internet connection WIFI. The a gourmet restaurant at the lodge serves fresh food: giant Tilapia from Lake Kivu, Fish captain Ituri, the vegetables from the vegetable Kibumba and Masereka, livestock meat Masisi, etc. In addition to the Restaurant is a modern bar where you can easily find both local and foreign drinks, respecting hygienic conditions and international standards, and in all their varieties (Beers, Sweet, Juice, Spirits, Liqueur, Aperitif, Digestive, Vin). For planning to organize meeting in Goma, the hotel has 3 rooms for meetings, conferences and ceremonies .These include; one with a capacity accommodating ± 600 seats, the 2nd with a capacity equal to ± 75 places and 3rd with a capacity of Home of ± 50 seats. Located in Goma, the capital of North Kivu province, in eastern of Democratic Republic of Congo, Caritas Hotel offers an exclusive view of the Lake Kivu. It has a capacity of 37 rooms that offer budget accommodation to visitors staying in the lodge. $ 40, $ 50 and $ 60 per night, breakfast included. For NGOs all rooms are for $ 50 per night. The lodge also has restaurant and bar which are open daily from 7:00 a.m. to 10:30 p.m. They serve local and some international wines, dishes or cousins. The budget facility offers two types of Conference rooms; one with capacity of 100 seats at USD $ 100 per day and the second with capacity of 25 seats at USD $ 50 per day. Virunga National Park spanning on an approximated area of 78,000square kilometers consists of an outstanding diversity of natural habitats, ranging from the snowfields of Rwenzori at an altitude of over 5,000 m, and from lava plains, swamps and steppes to the savannahs on the slopes of volcanoes. The natural habitat support the thriving of Mountain gorillas and some 20,000 hippopotamuses which live in the rivers and birds from Siberia spend the winter there. Virunga National Park is rare protected area with its active series/chains of volcanoes and rich diversity of natural habitats that surpass those of any other protected national park in African continent. 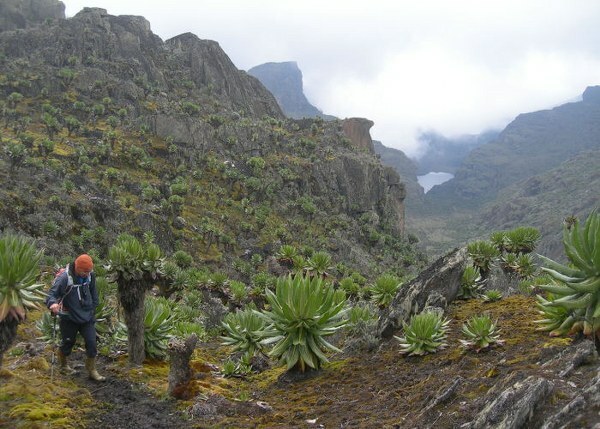 Its range has a combination of savannas, steppes and plains, marshlands, low altitude and afro-montane forest belts to exclusive afro-alpine vegetation and permanent glaciers and snow on Monts Rwenzori whose peaks reach 5000 m height. 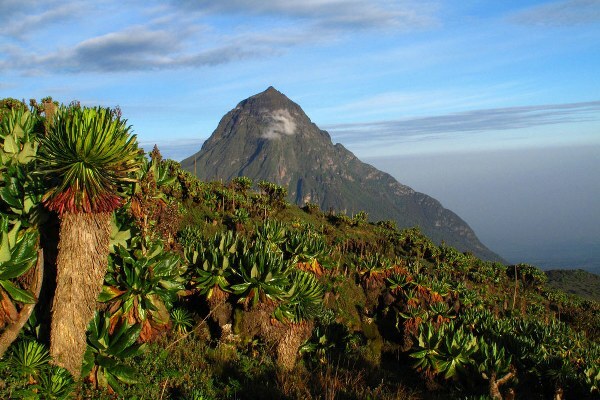 The national park includes the splendid massifs of Rwenzori and Virunga Mountains consisting of the two main active volcanoes of Africa. The broad variety of habitats produces extraordinary biodiversity, notably endemic species which are globally threatened species such as the mountain gorilla. Virunga National Park provides the most stunning montane landscapes in great African continent. 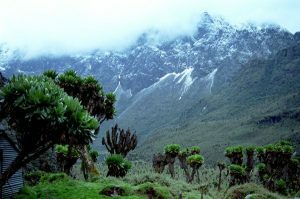 Mt Rwenzori with its snow peaks and jagged reliefs, their cliffs and steep valleys, and the precious volcanoes of the Virunga massif occupied /covered with the rare afro-alpine vegetation of tree ferns and Lobelia and their slopes covered by dense forests are the places of prodigious natural beauty. The volcanoes, which erupt after every few years and also constitutes of the dominant land features of the exceptional landscape. The Park offers different other spectacular views of the eroded valleys in the Ishango and Sinda regions. 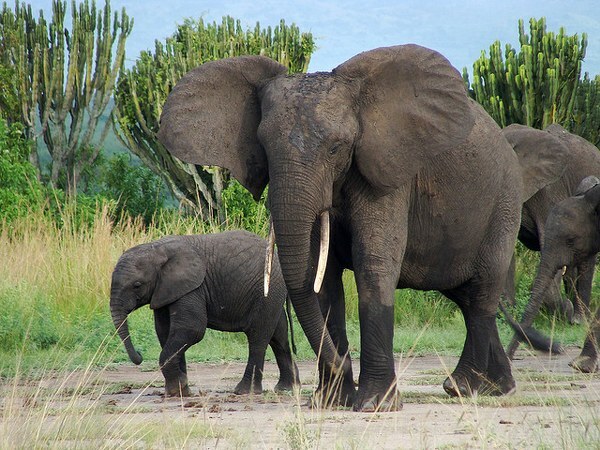 The Park also has significant cluster of wildlife species like the African elephants, buffalo and Thomas cobs, and the enormous cluster of hippopotamuses in Africa, with 20,000 individual’s thriving on the banks of Lake Edward and along the Rwindi, Rutshuru and Semliki Rivers. Virunga National Park possesses a very broad diversity of plants and habitats, making it the best African National Park for biological diversity. More than 2,000 premier plant species have been identified in the park, of which 10% are endemic to the Albertine Rift. The afro-montane forests represent about 15% of the vegetation. The Rift Albertine also contains more endemic vertebrate species than any other region of the African continent and the Park possesses numerous examples of them. The Park also boasts of 218 mammal species, 706 bird species, 109 reptile species and 78 amphibian species. It also serves as refuge to 22 primate species of which three are the great ape – mountain gorilla the eastern plain gorilla and the eastern chimpanzee, with a third of the world population of mountain gorillas. The savannah sections of the Park have a wide number of ungulates and the density of biomass of wildlife which is assumed to be one of the highest on the earth Planet (27.6 ton/km2). Among the ungulates, there are certain rare animals such as the okapi, endemic to the Democratic Republic of the Congo, and the red forest duiker and endemic to Monts Rwenzori. The Park also consists of vital tropical zones relevant for the wintering of Palearctic avifauna. Some of the enormous wild animal clusters in Africa occur along the rivers of the park. 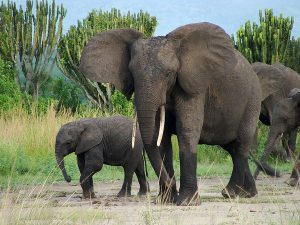 Mammals in the savannah of the Rwindi area include: elephant, hippopotamus, buffalo, numerous antelope including kob, defassa waterbuck and topi, warthog, lion and various monkeys. Large numbers of pelicans occur on the lower Rutshuru. In the Semiliki Valley and on the slopes of the Virunga mountains are gorilla, chimpanzee and okapi. In the extreme north are forest hog and bongo. Birds include Nahan’s francolin, forest ground thrush, shoebill and probably papyrus yellow warbler.